Rosa Vilcapoma Woodall, 44, of Ketchum, Idaho, died Saturday, Dec. 8, 2012, at the Ogden Regional Medical Center in Ogden, Utah due to a car accident. 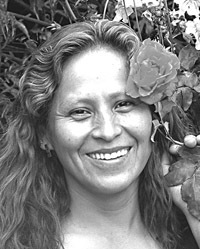 Rosa was born on Sept. 5, 1968, in Huancayo, Peru, to Cipriano and Lucasa Vilcapoma. She graduated from Maria Inmaculada High School in Huancayo, Peru. Rosa moved to the United States in 1996. She married Michael Woodall on Sept. 5, 2002, in Hailey, Idaho. When Rosa first arrived in the United States, she worked for Sun Valley Co., and for seven years at Globus Restaurant, then worked as a produce clerk for Atkinsons’ Market in Ketchum and as a housekeeper for the Selby family. Rosa loved spending time with her family. Rosa also enjoyed walking, camping, fishing, cooking and the Peruvian parties. Rosa was always thinking about her seven children. Her husband was always with her. Just the night before she said, “I love you and want to spend the rest of my life with you, Baby.” Michael was her baby. She is survived by her husband, Michael Woodall; her children, Andrea Aranda, Rose Kimberly Aranda, David Kevin Aranda, Amy Aranda, Jennie Woodall Lehman, Derrick Woodall and Cortney Paucar; her mother, Lucasa Vilcapoma; her sister Victoria Castillon and husband Danie (children Betty, July, Adriana and Michael); and sister Carmen Velazques (children Ronald, Jhean and Carlos Paucar); her brothers Jose Vilcapoma and wife Gladis (children Jesica, Jorge, Jose Luis, Paul and Scott), Jorge Vilcapoma and wife Isabel (two children), Pedro Vilcapoma (children Sandy and Peter) and Hector Vilcapoma and wife Milagros (daughter Danae); her children’s father, David Jaime Aranda; and many aunts, uncles and cousins here and in Peru. She was preceded in death by her father, Cipriano Vilcapoma and her nephew Silver Paucar. A memorial fund has been established for Rosa Woodall. Donations may be given to any Wells Fargo Bank. A rosary and viewing were on Tuesday, Dec. 11, at Wood River Chapel in Hailey. A funeral service was held on Wednesday, Dec. 12, at St. Charles Catholic Church in Hailey. Burial was at the Hailey Cemetery with a reception following at the Community Campus.